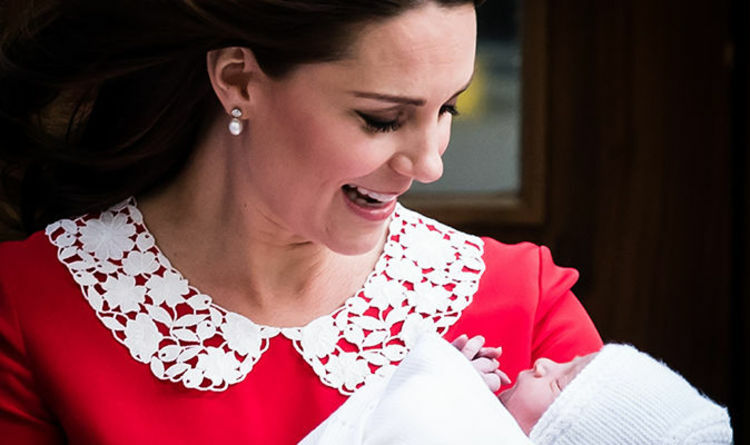 The celebrations will mark the three-month-old prince’s first public outing since he was welcomed into the world on St George’s Day. The little prince has not been seen in public since a radiant Kate showed off her bundle of joy alongside Prince William on the steps of the Lindo Wing of St Mary’s Hospital in Paddington, on April 23. He has so far missed key events including Meghan Markle and Prince Harry’s Royal Wedding and Trooping the Colour for his great grandmother the Queen’s birthday. But on Monday the newborn prince will make his next appearance at the private Chapel Royal, where he is expected to be joined by just 20 to 30 guests for the intimate occasion. And like his brother and sister before him, Prince Louis will wear the traditional family Honiton lace christening robe. The beautiful antique gown is an exact replica of the first worn by Queen Victoria’s eldest daughter Princess Victoria in 1841. It was made by Janet Sutherland using the same fabrics which Victoria had incorporated into her wedding dress the year before - Spitalfields silk and Honiton lace. The original was used as recently as 2008 for royal christenings, but was replaced due to its age and fragility. Writing for ‘Royal Babies: A celebration through history’ by Annie Bullen and Gill Knappett, it reads: “The Honiton lace gown had been worn by royal babies at their christenings for 167 years and was beginning to look a little tired when the Queen decided to commission a hand-made replica from royal dressmaker Angela Kelly. The water used to baptise Prince Louis will be sent from the River Jordan in the Middle East. The practice is followed because the river is where Jesus was baptised by John the Baptist. And in 2015, the specially sterilised water was flown in for the baptism of Princess Charlotte. The ceremony, which will last around 30 minutes, will be conducted by the Archbishop of Canterbury. The Royal Family, godparents and guests will stand near the font, waiting for the baby to be carried into the room by his nanny, accompanied by a lady-in-waiting. All royal babies are christened in the Lily Font bowl, an exquisite silver-gilt font used by the Royal Family since 1840. The gilded silver font, which weighs 21 pounds, was commissioned by Queen Victoria and Prince Albert ahead of the birth of their first child. Part of the Royal Collection, the font has been used for all subsequent royal christenings except for Princess Eugenie, who had a public baptism. When not being used for royal baptisms, the silver-gilt Lily Font is kept with other royal treasures in the Tower of London. After the christening ceremony, the baptismal register will be signed before guests are invited to a private tea party, where a splendid christening cake is served. The christening celebrations are expected to kick start the Cambridges" summer holiday when they will split their time between London and Anmer Hall in Sandringham, Norfolk.